Medulloblastoma is a type of brain cancer that starts in the part of the brain called the cerebellum. Medulloblastoma is the most common type of cancerous brain tumor in children. Medulloblastoma (muh-dul-o-blas-TOE-muh) is a cancerous (malignant) brain tumor that starts in the lower back part of the brain, called the cerebellum. The cerebellum is involved in muscle coordination, balance and movement. Medulloblastoma tends to spread through cerebrospinal fluid (CSF) — the fluid that surrounds and protects your brain and spinal cord — to other areas around the brain and spinal cord. This tumor rarely spreads to other areas of the body. Medulloblastoma is a type of embryonal tumor — a tumor that starts in the fetal (embryonic) cells in the brain. Based on different types of gene mutations, there are at least four subtypes of medulloblastoma. Though medulloblastoma is not inherited, syndromes such as Gorlin's syndrome or Turcot's syndrome might increase the risk of medulloblastoma. 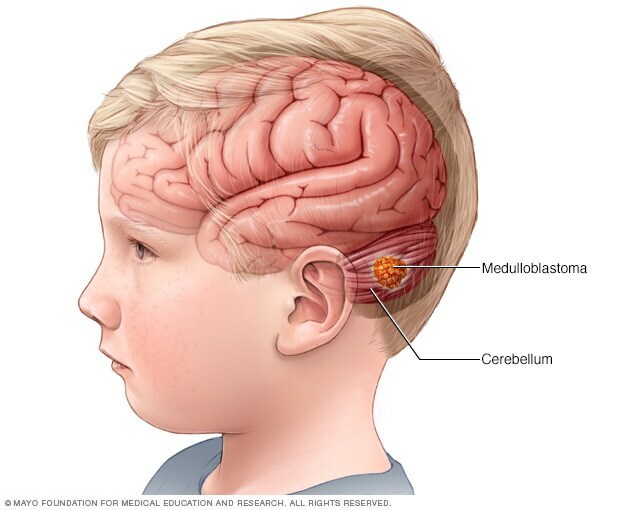 Signs and symptoms of medulloblastoma may include headaches, nausea, vomiting, tiredness, dizziness, double vision, poor coordination, unsteady walk and other concerns. These symptoms may be related to the tumor itself or be due to the buildup of pressure within the brain. Medulloblastoma can occur at any age, but most often occurs in young children. Though medulloblastoma is rare, it's the most common cancerous brain tumor in children. Children need to be seen at a center that has a team of pediatric specialists with expertise and experience in pediatric brain tumors, with access to the latest technology and treatments for children. Neurological exam. During this procedure, vision, hearing, balance, coordination and reflexes are tested. This helps determine which part of the brain might be affected by the tumor. Imaging tests. Imaging tests can help determine the location and size of the brain tumor. These tests are also very important to identify pressure or blockage of the CSF pathways. A computerized tomography (CT) scan or magnetic resonance imaging (MRI) may be done right away. These tests are often used to diagnose brain tumors. Advanced techniques, such as perfusion MRI and magnetic resonance spectroscopy, also may be used. Tissue sample testing (biopsy). A biopsy is usually not done, but it may be recommended if the imaging tests are not typical of medulloblastoma. The sample of suspicious tissue is analyzed in a lab to determine the types of cells. Removal of cerebrospinal fluid for testing (lumbar puncture). Also called a spinal tap, this procedure involves inserting a needle between two bones in the lower spine to draw out cerebrospinal fluid from around the spinal cord. The fluid is tested to look for tumor cells or other abnormalities. This test is only done after managing the pressure in the brain or removing the tumor. Surgery to relieve fluid buildup in the brain. A medulloblastoma may grow to block the flow of cerebrospinal fluid, which can cause a buildup of fluid that puts pressure on the brain (hydrocephalus). Surgery to create a pathway for the fluid to flow out of the brain (external ventricular drain or ventriculoperitoneal shunt) may be recommended. Sometimes this procedure can be combined with surgery to remove the tumor. Surgery to remove the medulloblastoma. A pediatric or adult brain surgeon (neurosurgeon) removes the tumor, taking care not to harm nearby tissue. But sometimes it's not possible to remove the tumor entirely because medulloblastoma forms near critical structures deep within the brain. All patients with medulloblastoma should receive additional treatments after surgery to target any remaining cells. Radiation therapy. A pediatric or adult radiation oncologist administers radiation therapy to the brain and spinal cord using high-energy beams, such as X-rays or protons, to kill cancer cells. Standard radiation therapy can be used, but proton beam therapy — available at a limited number of major health care centers in the United States — delivers higher targeted doses of radiation to brain tumors, minimizing radiation exposure to nearby healthy tissue. Chemotherapy. Chemotherapy uses drugs to kill tumor cells. Typically, children and adults with medulloblastoma receive these drugs as an injection into the vein (intravenous chemotherapy). Chemotherapy may be recommended after surgery or radiation therapy, or in certain cases, at the same time as radiation therapy. In some cases, high dose chemotherapy followed by stem cell rescue (a stem cell transplant using the patient's own stem cells) may be used. Clinical trials. Clinical trials enroll eligible participants to study the effectiveness of new treatments or to study new ways of using existing treatments, such as different combinations or timing of radiation therapy and chemotherapy. These studies provide a chance to try the latest treatment options, though the risk of side effects may not be known. Talk with your doctor for advice. Childhood central nervous system embryonal tumors (PDQ): Health professional version. National Cancer Institute. https://www.cancer.gov/types/brain/hp/child-cns-embryonal-treatment-pdq. Accessed Oct. 12, 2017. Pomeroy SL. Clinical presentation, diagnosis, and risk stratification of medulloblastoma. https://www.uptodate.com/contents/search. Accessed Oct. 12, 2017. Medulloblastoma – Childhood: Treatment options. Cancer.Net. https://www.cancer.net/cancer-types/medulloblastoma-childhood/treatment-options. Accessed Oct. 12, 2017. Pomeroy SL. Treatment and prognosis of medulloblastoma. https://www.uptodate.com/contents/search. Accessed Oct. 12, 2017. Call JA, et al. Long-term outcomes and role of chemotherapy in adults with newly diagnosed medulloblastoma. American Journal of Clinical Oncology. 2014;37:1. Pomeroy SL. Histopathology and molecular pathogenesis of medulloblastoma. https://www.uptodate.com/contents/search. Accessed Oct. 14, 2017. Mahajan A (expert opinion). Mayo Clinic, Rochester, Minn. Oct. 18, 2017. Louis DN, et al. The 2016 World Health Organization Classification of Tumors of the Central Nervous System: A summary. Acta Neuropathologica. 2016;131:803. Nageswara Rao AA (expert opinion). Mayo Clinic, Rochester, Minn. Oct. 22, 2017.